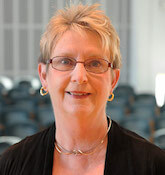 Dr. Lissa May, Associate Dean for Instruction and Professor of Music Education at the Indiana University Jacobs School of Music, has an extensive background in instrumental music education. She began her career as a middle school and high school band director, and then spent seven years as Director of Jazz Studies at Purdue University. After serving three years as Supervisor of Fine Arts in the Waterford (MI) School District, she joined the Jacobs School of Music faculty, where she placed and supervised student teachers for more than a decade. She has served as president of the Indiana Bandmasters Association and the Indiana Music Educators Association. She is the recipient of Jazz from Bloomington’s Al Cobine Award, the Jazz Journalists Association Jazz Hero Award, and the Phi Beta Mu Gamma Chapter Hall of Fame Award. May frequently serves as a guest conductor, clinician, and adjudicator. Her guest conducting appearances include the Indiana All-State Band, Colorado Music Educators Association All-State Jazz Band, Wisconsin Honors Jazz Project, University of Nebraska at Omaha Honors Band, Southeastern Louisiana University Honor Band, as well as innumerable engagements at festivals and honor bands throughout the United States. She has served as a clinician across the country and has presented research posters and papers at professional conferences in the United States, United Kingdom, and Cyprus. May’s publications include compositions for jazz and concert band and articles in the Journal of Research in Music Education, Journal of Historical Research in Music Education, Jazz Research Papers, Arts Education Policy Review, and Spotlight on Transition to Teaching. She is author of Getting Started with Jazz and recently authored a chapter, “Indiana Avenue and Crispus Attucks High School,” in David Baker: A Legacy in Music (Indiana University Press). She contributed a chapter, “A Content Analysis of Band Repertoire Performed at the Indiana State School Music Association State Concert Organizational Finals: 1985–2010” to Advances in Social-Psychology and Music Education Research (Patrice Madura Ward-Steinman and contributors). She also contributed a chapter in Teaching Music through Performance in Jazz (GIA Publications) and is co-author of A Guide to Student Teaching in Band (GIA Publications).